The Cathodic Protection transformer rectifiers “UKZT-TM” (UKZT-A OPE TM-GSM & UKZT-AU OPE TM-GSM) are intended for protection of underground metal constructions against soil corrosion by a method of cathodic polarization. In contrast to CPTR “UKZT-U”, this rectifiers have microprocessor controller “KATRON-SKZ” as control block. This makes possible integration of the rectifiers to the telemetry system “STEL-K” or to some others SCADA-systems by standard Modbus RTU protocol of CAN/RS485 interfaces with the ability to remotely monitoring and control of rectifiers settings. The controller “KATRON-SKZ” is realized as multi-blocks module and include microprocessor block, GSM-modem and reserve power supply block with external accumulator battery. This one give opportunity transfer measured values of rectifier’s output voltage and current, protective potential, alarm signals (as not sanctioned opening of a rectifier’s box), data of power counter and time counters by GSM communications. The CPRT “UKZT-TM” have the universal construction, what make possible universal using of cathodic protection rectifiers of series “UKZT”, “UKZT-U” and brand name rectifiers “Don”, “Don-U” and “Don-TM” in the project phase and installation. 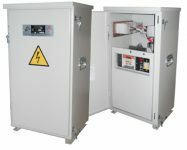 UKZT-A OPE TM-GSM X,X Y1 – the automatic CP transformer rectifiers with manual and auto control of output current or protective potential. This one has dimentions of CP rectifiers of “UKZT” type. UKZT-AU OPE TM-GSM X,X Y1 – the automatic CP transformer rectifiers with manual and auto control of output current or protective potential. This one has dimentions of CP rectifiers of “UKZT-U” type. – Emergency signalisation to central computer and transfer dubler SMS-message to mobile phones of staff. Archiving of electronic journal of the CP rectifier, with a measurement each hour and the volume of the journal for 2 last months (archive). Thanks to this option the controller has function of intelligent control in case of accident situation. As example: Rectifier work in automatic mode with stabilization of protective potential. After some time a sensor of protective potential is destroyed and rectifier can not stabilize set value of protective potential. In this case, the controller send alarm message to central computer (staff cells) and after that read from archive the value of output current for value of protective potential which was set and switched to mode automatic stabilization of output current with set value which was read from archive.